Something stirs in the deep shadows, something terrible, and the wind, which knows evil well, shrinks from this place. It flees toward the safety of those magnificent tall buildings that promise the blue skies, nothing but blue skies, of the future, of industry and prosperity; the future, which does not believe in the evil of the past. If the wind were a sentinel, it would send up an alarm. It would cry out a warning of terrors to come. But it is only the wind, and it knows well that no one listens to its cries. Will looked over the top of his spectacles. “You say, ‘God told me the following,’ and then wait for people to sign up." Deep in the cellar of the dilapidated house, a furnace comes to life with a death rattle like the last bitter cough of a dying man laughing contemptuously at his fate. A faint glow emanates from that dark, foul-smelling earthen tomb. Yes, something moves again in the shadows. A harbinger of much greater evil to come. Naughty John has come home. And he has work to do. Intelligent, complex and historically accurate, The Diviners in a riveting tale that plumbs the depths of human wickedness brought about by religious fanaticism and fascination with the occult. The blend of tension, charm, creepiness, atmosphere and characterization come together to ensure this to be an absorbing and intellectually stimulating experience. This is an absolutely phenomenal book and one of the best of the year thus far. An indisputable must-read for anyone who enjoys a thoroughly bone-chilling story set against well researched historical backdrop. 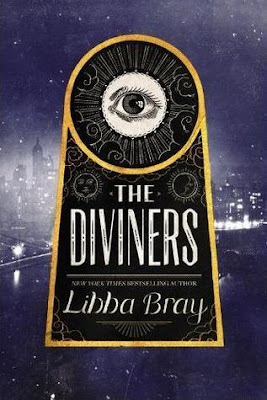 Set in the Roaring Twenties in New York City, The Diviners tells the story of a group of young people investigating a series of gruesome occult-based murders. Something dark and powerful has been unleashed in New York, an evil force determined to bring about an apocalypse. People are being murdered - their body parts missing - and it all seems to follow a very disturbing pattern suggesting that the murderer is trying to finish a dark ritual started many years ago. A ritual that will unleash hell on earth and destroy everything. When Evie is shipped off to New York to live with her Uncle Will, the last thing she expects is to find herself right in the middle of a terrifying murder case. Instead of attending glamorous parties and enjoying vibrant New York life, she now has to deal with a psycho-ghost intent on carrying out his evil plan. Will her special powers help catch the killer? Or will the killer get to her first? Evie (or as Theta calls her, Evil) is a fascinating character. Bold, attention-loving, dauntless, unpredictable, loud-mouthed and quick-witted, she's an unstoppable force, a real tornado of a girl. She's a troublemaker. She doesn't know when to keep her mouth shut and rarely listens to anyone else, especially her parents and uncle . She doesn't back down from anybody and isn't easily intimidated. She's curious (sometimes a little bit too much for her own good), intelligent, snarky and pos-i-tute-ly energetic. All in all, she's a fine example of a reckless, fun-loving, convention-breaking flapper gal. On top of that, she is also a diviner, a person with a special ability. Evie's special talent allows her to tell people's secrets just by holding an objects that belongs to them and concentrating on it. Her extraordinary personality makes it extremely fun to follow her adventures. I instantly connected with her and wanted to get to know her better. She is my kind of heroine and I can't wait to meet her again. All the characters in The Diviners - and it's a rather large cast - are beautifully fleshed out, vibrant and intriguing. They possess great qualities - their behaviour, motivations and reactions to events taking place around them are realistic and the range of emotions they show is quite incredible. I found them convincing, three-dimensional, and easy to care about. Some characters I liked more than others, but overall each one of them had a role to play - even if only a minor one - and they all seemed essential to the plot. I appreciated the diversity of cultural and social backgrounds that these characters came from and the fact that these were not your stereotypical, embellished YA heroes and heroines, but rather real teenagers, with real problems, dreams and fears. Misfits who struggled through life, drank, cried, worried and lied. I also liked the fact that the romance part of the story was almost non existent and all the romantic plot threads took a back seat to the main storyline. At nearly 600-pages-long, this behemoth of a novel offers an insightful, compelling narrative, a meticulously researched historical and cultural background, a completely mind-blowing world-and-character building, and a disturbing story line that is sure to send chills down your spine. Could this book have been shorter? Perhaps. Would I want it to be shorter? Absolutely no. I loved every detail, every little nuance that Libba Bray weaved into the plot. They all added depth to the story and helped recreate the unique atmosphere of 1920s New York. In the Author's Note, Bray talks about the many hours spent pouring over books, photographs and various other sources that went into creating the world of The Diviners and I can't help but to feel impressed with how fabulous a job she did. She has breathed life into this story, these characters and settings. She made me forget about the real world for a while and lose myself in the world of flappers, vibrant city life, hobble skirts, first automobiles, jazz and petting parties. And it was swell! Everything - from the slang words and outfits to the social movements and politics of that time period - was fantastic. I really couldn't have loved this book more! So don't let the size of this book intimidate you, once you get sucked into the story you'll be in a real page-turning frenzy! All in all, The Diviners is an accomplished novel and a very exciting new YA series that is as ambitious and intelligent as it is entertaining and downright scary! I highly recommend it! I was definitely impressed with the amount of historical research behind this book. The world felt "real" even though it's a fantasy/paranormal. I also preferred the plot to Bray's other books I've read. I need to get to this!! I have a ton of tours coming up the next few weeks so I haven't had time to devote to it, but I am super excited to read it! Awesome review, you have made me more excited! I've been reading a lot of more critical reviews of this book and therefor didn't really want to go read it . . . But this review basically gave me everything I needed for the push into reading the book! Thanks so much! This book blew me the heck away. It was amazing. I usually don't have a hard time with books that are so character driven, but I was completely in The Diviners. I loved this book. I have tried writing a review for it and I am having such a hard time conveying how truly amazing it was. More power to you for being able to write such a great review! Excellent review!!! Makes me even more excited to read this than I already was! There's a waiting list at my library for this one...I just might have to splurge and buy it for myself. I love loooong books - when they're great! - and it sounds like this one is right up my alley. Glad you loved it so much! I am looking forward to reading The Diviners so much! Great review.